When fresh food sprouts on urban rooftops, floating barges, and in once-abandoned buildings and schoolyards, people take notice. “Spaces that have gardens have a different atmosphere than vacant lots,” notes Anne Palmer, program director for Johns Hopkins Center for a Livable Future. But are these farms good for more than turning urban blight into tomato blossoms? A new report suggests that many of us might be seeing the benefits of urban farming through rose-colored glasses. 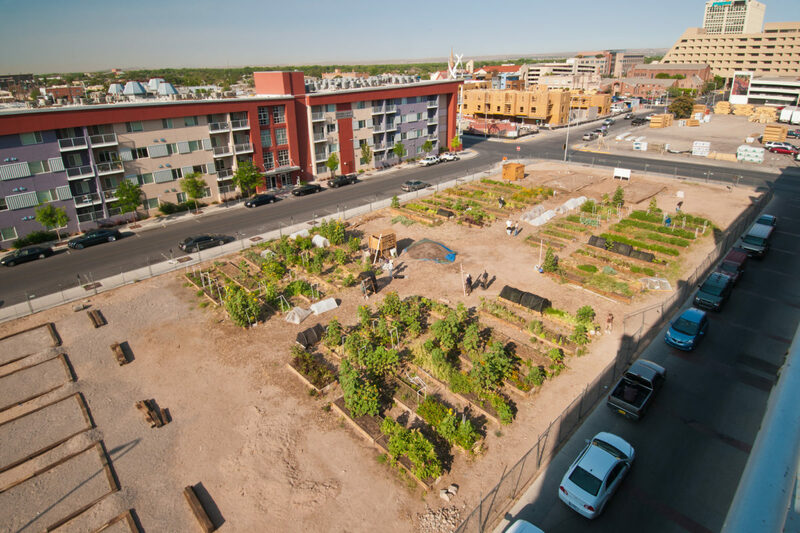 The Center for a Livable Future reviewed 167 studies on urban agriculture (looking mainly at community gardens) and found mixed results. First, the good news: The research links urban farming to better access to fresh foods (at lower prices), potential reduced greenhouse gas emissions and improved carbon sequestration, workforce training opportunities, increased property values, and opportunities for community involvement. Tyson Gersh, co-founder and farm manager at the Michigan Urban Farming Initiative in Detroit, has seen many of these benefits firsthand. The farm Gersh runs provides low-income residents and food pantries with fresh fruits and vegetables they probably wouldn’t have access to otherwise. Although the farm has produced more than 50,000 pounds on just one-acre of city land over the past four seasons, Gersh recognizes that is a drop in the bucket when it comes to how much food is needed by a city the size of Detroit. Producing enough food to make an impact on the needs of urban dwellers is a big challenge of urban agriculture. On a global level, the Worldwatch Institute reports that up to 20 percent of the world’s food is grown in urban areas. But it’s unclear whether the U.S. will ever meet that number. The Hopkins researchers point to one study in New York which found that transforming all suitable vacant land into urban farms would only yield enough fresh produce to feed between 103,000 and 160,000 residents—a small percentage of the city’s 8.4 million residents. The other challenges cited in the report include a less efficient use of resources, poor soil management practices, and health risks associated with airborne pollutants, as well as the potential for food grown on urban farms to be sold outside the neighborhood or at prices local residents couldn’t afford. Palmer agrees. She insists that although the report found significant challenges with the model, it was not intended to discourage urban agriculture. In fact, she wants everyone, including those interested in starting urban farms, to understand the impacts—both positive and negative—of growing food in cities. it would be helpful to have analyses of how many people can be supported by how much acreage and water supply when it's managed with permaculture principles. Refreshing to see a few activists enjoying a lucid moment and placing urban agriculture in correct perspective. Sure, it's a nice thing to do, a novel feel-good project. But urban gardeners take themselves much, much too seriously. They did not invent gardening. They certainly are not reinventing farming. They are merely obsessed with their newfound hobby. In fact, most of what is grown in these urban gardens is about 90% water by weight (fresh veggies, greens, small fruits, etc.) and for the example farm that produced 50,000 pounds of food, they actually produced about 45.000 pounds of water and about 5000 pounds of nutrients and fiber. That's about 1/2 to 3/4 of the volume of nutrients and fiber consumed by only about a dozen people! What about vertical gardens/farming that might allow us to utilize the smaller spaces and produce more? Also, the benefits of urban farms go way beyond fresh veggies. Read Farmacology by Dr. Daphne Miller as it will change your skeptical minds!! The picture featured here is of a garden I used to work in that hasn't existed for two years. Its in Albuquerque, NM (not mentioned in the story) of a Veteran Farming project sponsored by La Montanita Co-op. While this garden didn't produce significant food, it not only brought people together, anecdotally it had major positive mental health impacts directly for the vets involved and indirectly on the whole neighborhood. Not to mention that they couldn't do it without grant money. Gardening is a Green GYM. For those who are on low income/ Elderly and Dissabled. Gardening helps keep people fit and healthy. And great for Mental state of mind. One day your computer and elect city will breakdown. WHO do you think will feed you? So better treat your Gardening Neighbour and help them water their garden. And help take your veg peeps/paper/cardboard/empty egg box/egg shells to be turned into leafmould. I'm not a 'foodie,' which may be an uncommon statement for a chef, but I have held a strong interest in organic gardening since Rodale Press gave me my first photo assignment in 1967. Today, I'm interesting in all of the above factors as they relate to the rural environment, -our once rich "agricultural sector," now ID'd by the USDA as a veritable "food desert." Please watch this evolving space. Chez Kiva.